In a white prefabricated trailer in the desert east of Amman, a Syrian refugee, Mahmoud, calmly followed with clear interest his teacher’s explanation about the vapor compression cycle, part of basic refrigeration technology. Mahmoud, 24 years old, was in his third year as a philosophy student at the University of Damascus when the Syrian uprising broke out. Now, in Zaatari camp, the largest one for Syrian refugees, he serves as an example of a debate about how higher education might best be delivered to university-age youth who are eager to complete their education. Scholarships and travel to distant countries are expensive, and can reach only a small minority of refugee youth. 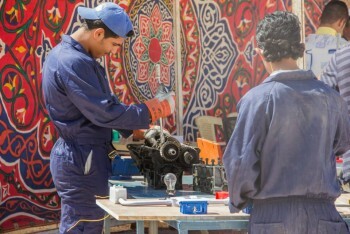 Vocational education is sometimes a quick fix and, if done right, might actually lead to the employment that many refugees need. But is a disappointment for some young people capable and interested in attaining broader knowledge. A third option, trying to work with universities in the region to admit more Syrian students, is gaining in popularity but has its own problems. Mahmoud’s difficulties began in Damascus, where he served three months of detention after some of his peers reported him to the government as a security risk. Like thousands he fled to Jordan without any official documents that proved his academic qualifications. He was thinking of taking the high school exam again in the camp, when he learned about the youth program of the Norwegian Refugee Council (NRC). “It’s an opportunity to learn something new instead of starting school again from scratch,” he said. Mahmoud is one of hundreds of young Syrians, who have joined the youth program offered by the refugee council since early 2013 in Zaatari. The program later expanded to two other camps in Jordan, the Azraq and the Emirati-Jordanian camps. The program focuses on Syrians between 16 and 32 years old. It generally offers three-month courses on subjects such as tailoring, barbering, electrical wiring and air conditioning. It also supports classes in more general topics such as Arabic, mathematics and life skills. Some business-related topics like office management is also taught. The offered courses are not formally certified, but more than 1,000 students have benefited from the program in Zaatari since it began, Bonar said. The graduates of the program can’t go to work because they can’t leave the camp, but Bonar believes that the education they get is better than the alternative of them doing nothing. She knows the program has deep flaws. “It’s not the response they need,” she said. “Many of them need to finish their degrees.” The program was designed for African countries in crisis where students mostly needed to learn how to read and write. But the Syrian case is dramatically different because many of the camp youth are well educated. “It’s very challenging to keep up with these young people, they are hungry for knowledge and need more advanced programs,” she said. “Scholarships are a drop in the ocean,” said Martina Sedlakova, until recently the Syria program officer for SPARK, a Netherlands-based organization that helps young people in conflict-affected societies. According to Sedlakova, the involved institutions need to develop new programs with a long-term perspective. “We should bridge between the humanitarian and development response when planning a project for Syrians,” she says. Also, Sedlakova said that thousands of Syrian refugee youth are outside of the camps and usually not reached by existing programs. SPARK has already started “Syrian summer university in exile,” a pilot program aimed at giving moderate Syrian students, who have for the most part stopped their studies, skills that might help them deal with the emergency situation they face and the eventual transition in Syria. “Our courses have an applied focus, offering skills and knowledge that participants can immediately utilize to address emergency needs or preparing for the phase of transition,” Sedlakova said. Moreover, SPARK couples Syrian professors with Turkish and Western professors to teach the courses together. That builds international networks as well as teaching the students. Like all first steps, there are always some missteps. And the program has its difficulties. “We are working from a distance and the conflict is still going on,” said Sedlakova. Still, she believes that concerted efforts could make a difference. SPARK has already developed a new scholarship scheme that aims to support regional governments to take Syrian students rather than sending them to study in distant countries. “The cost is clearly less and the scheme allows for more joint components between Syrians and local hosting community,” she said. Recognizing the importance of supporting the host communities, the Institute of International Education is planning to start a “From Camp to Campus” pilot project in Jordan, which will provide scholarships and supplemental support to Syrian university students in the Zaatari refugee camp to complete their education at nearby universities. The project will also provide scholarships to disadvantaged Jordanian students. “We are working closely with local universities and the Jordanian ministry of higher education on this project,” said James King, the senior research and program officer of the Institute for International Education’s Scholar Rescue Fund. King has already finished working on a report on the situation and needs of Syrian students and academics in Turkey. The report also recommended that governments provide scholarships for Syrians to study at regional universities. On the other hand, the idea of offering higher education online to refugees could be worth thinking about too. Jesuit commons: higher education at the margins provides six-month online courses in the fields of tourism, medicine, non-governmental organizations and law. The courses are accredited by Regis University in the United States. The program receives students from Iraq, Syria, Sudan, Somalia, Palestine and Jordan. But the courses are taught in English and can only take so many students. “If we all work as a sector we could do a lot,” Bonar said. Meanwhile, Mahmoud is trying to understand the air conditioner’s motor and dreaming of going back to his old seat in the faculty of philosophy. * Below is a partial list of organizations helping Syrian youth get an education. The Global Platform 4 Syrian Students was started by the former president of Portugal, Jorge Sampaio, with the help of a broad group of partners and gives grants and scholarships to students. No Lost Generation, Unicef has numerous partners who work with Syrian children to try to alleviate trauma and give them the civic skills and the education they need to be able to rebuild their country one day. International Network for Education in Emergencies (INEE) works to support those who are trying to deliver education to students caught up in crisis or conflict. The Unesco office in Amman is directing a project of 4.3 million euros to improve education and skills development for Syrian and Jordanian youth affected by the refugee crisis. Unicef ‘s Children of Syria microsite is a source of information on efforts to help Syrian children. 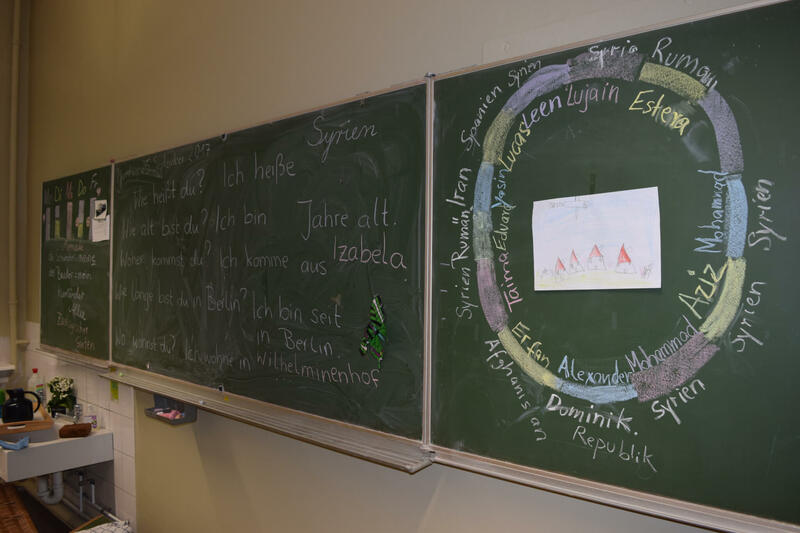 Institute of International Education runs multiple programs aimed at helping Syrian students including the Scholar Rescue Fund and the Syrian Consortium for Higher Education in Crisis. Illinois Institute of Technology (IIT) is offering merit-based scholarships of up to $25,000 and mentoring to Syrian students living in any country. Kaplan Test Prep International has been helping Syrian youth interested in attending universities outside of Syrian to prepare and take the tests sometimes necessary for admission. The University of California, Davis and its Human Rights Initiative have been active in writing reports that document the plight of Syrian youth and recommend solutions. Thanks for the article. It gives an interesting survey of the initiatives to help Syrian youth. I recognize that our students thrive to go back to universities. But Wouldn’t Syria after war in need of different skills than university degrees? I say that as an insider of our Syrian higher education that till now is still very theoretical and completely separated from reality. I think that we have to work on the mentalities, and have deeper interactions with the youth to orient them to “more constructive” education options (when options are available..). Thanks Oula for your kind comment. I agree with you that our Syrian higher education is still theoretical and mostly separated from reality. And to work on the mentalities, we need to work on education by providing the right one. Now for refugees, going back to classes is very essential as you already known from your work experience. We need to find opportunities for them. There are good efforts, but do not reach them all. Initiatives and efforts compilation could be a good step to achieve that. Of course the first steps of reconstruction passes through education. I would never say the contrary. Providing good education to Syrians is a battle of mine… I am just saying that there are many forms of education and we have to explain to the youth and their parents that achieving in life is not reserved to people with university degrees. I just want to infer that the design of programs destined to Syrians must take into account a need to work on the mentalities in addition to classical content and training selection. Hoping for some clear actions and outcomes from this week’s International Conference on Higher Education in Brussels. I look forward to continuing and expanding the discussion during the conference. See you there Rasha. I just watched the video. Its very interesting, I wish we had watched it during the conference today. I shared it on our Facebook page, thanks Emma for all your cooperation and interest in sharing thoughts and information with us.